Pomona 8-pin SOIC clip with attached jumper wires. In-System Programming (ISP) sometimes also called in situ programming is used to describe the procedure of writing a flash chip while it is (already/still) attached to the circuit it is to be used with. Of course any normal "BIOS flash" procedure is a kind of ISP but when we refer to ISP we usually mean something different: programming a flash chip by external means while it is mounted on a motherboard. This is usually done with SPI chips only. Some mainboards have a special header for this (often named "ISP", "ISP1", or "SPI") and there should be no problem with accessing the chip then as long as the wires are not too long. 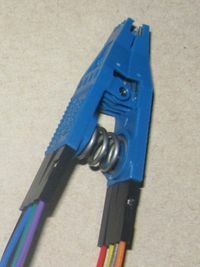 If there is no special header then using a special SO(IC) clip is an easy and reliable way to attach an external programmer. They are produced by different vendors (e.g. Pomona, 3M) and are available from many distributors (I got mine from Distrelec) for 20-50$/€. See the list of problems common with other types of programming setups first. Try powering up the board normally and holding it in reset (e.g. use a jumper instead of the reset push button). Some chipsets (e.g. Intel ICHs/PCHs) have edge triggered resets. In this case holding them in reset will not work. This is especially a problem with Intel chipsets because they contain an EC (named ME by Intel), which uses the flash (r/w!). In this case you can trigger the reset line in short intervals. For example by connecting it to the chip select (CS) line of the SPI bus or a dedicated clock signal from the programmer. This should not be too fast though! Reset lines usually require pulses with a minimum duration. 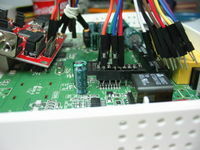 On some boards, you can try disconnecting the ATX12V header (yellow/black wires only) from the motherboard, or even remove the CPU or RAM - if the programmer supports SPI sniffing, you may be able to verify that the there is no SPI traffic.